In theory Irish people should not care who is president of the United States of America. However, in reality the recent election was the single biggest topic of conversation in Ireland for the last few weeks. This is partly because USA is such a dominant world power, but also because for historical reasons most Irish people have many close relatives living in the USA. In fact many Irish people (including me) have a right to a postal vote as a result of holding American citizenship. So there are active groups campaigning in Ireland for such votes. In the lead up to election day, most professional opinion polls were predicting that the election was too tight to make a definitive prediction. 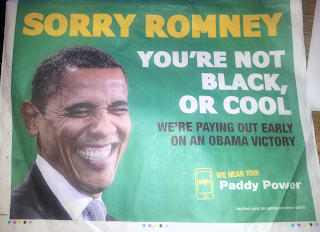 However, on the day before polling, Irish based bookmaker Paddy Power announced that they were so confident that Obama was going to win that they were going to pay out immediately to anyone who had bet on him. This was effectively a very cheap publicity stunt becuase although they claimed it cost them over half a million euro, it ended up costing them nothing because Obama won and the would have had to pay out on all these bets anyway. I know that the advertisement for this offer which featured the tag line "Sorry Romney - you're not black or cool" was intended to be very much tongue in cheek, but I must say that I found it quite offensive. It was intended to poke fun at Mitt Romney who is not very popular among the Irish public so maybe they felt safe, but the attached picture of president Obama is not very flattering so I suspect that they alienated many of his fans also. There has been some debate in Irish newspapers recently about whether Ireland should offer some form of voting rights to the Irish Diaspora. This could be quite significant since there are many more Irish citizens (or at least people entitled to Irish citizenship) resident in United States than are resident on the island of Ireland. I wonder how Irish people would feel if a similar advertisement poking fun at Irish politicians was running in American newspapers.